WeatherNet includes sub-surface sea temperatures and our Thermocline product. Sub-surface temperatures at 10, 20, 30, 50, 75, 100, 150, 200, 250, 300, 500 and 1000 meters are now available for any block of the ocean anywhere in the world. We then combine those 12 layers into a single file and make it available as a new, highly compressed Thermocline product. Box any area of any ocean in WeatherNet and download specific sub-surface temperature layers of interest to you or the whole set within the Thermocline product. Having a multi-layer Thermocline product is one thing and being able to pull useful fishing information from it is another. 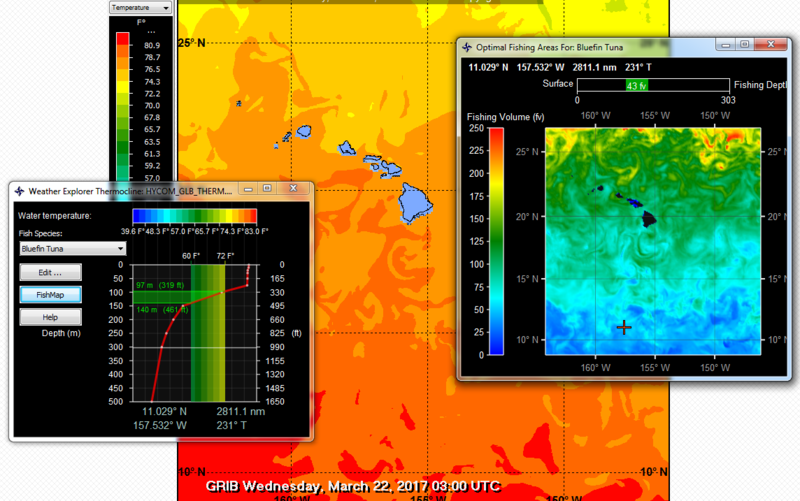 To extend the reach of WeatherNet’s Thermocline product we have built within our new GRIB Explorer ver. 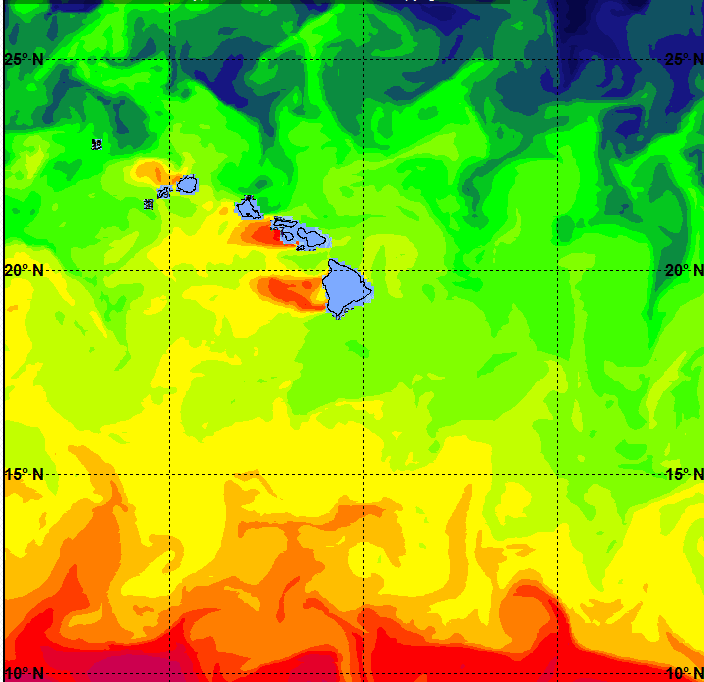 9 a visualization tool which allows you to see down through those layers of ocean sub-surface temperature. 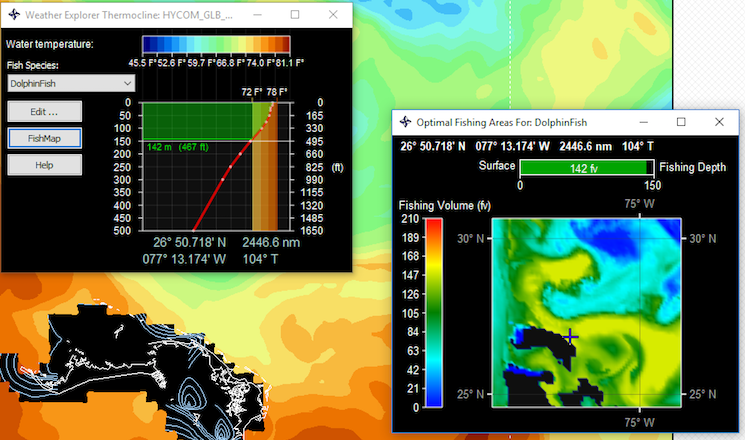 Download a block of ocean Thermocline for the area in which you are fishing, watch it load automatically into GRIB Explorer 9, tap GRIB Explorer’s Thermocline icon and then move your cursor around the GRIB Explorer screen. You end up with an unprecedented view of temperature at depth and an on-the-fly means of detecting the location of the mixed layer depth under any spot on the oceans surface. GRIB Explorer version 9 integrates the Thermocline tool and mixed layer visualization with the preferred temperatures of 40 different fish species so you can see where in the water column are the temperatures preferred by the species you are targeting. 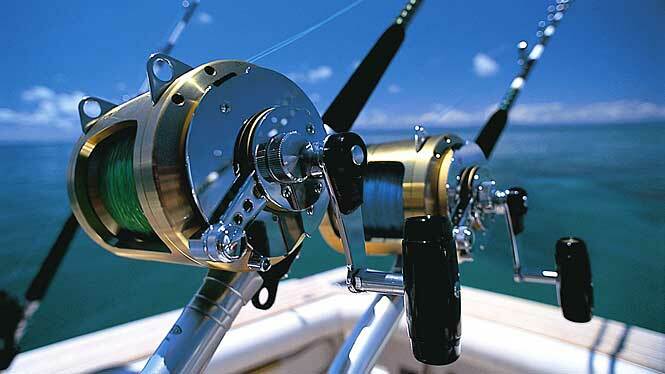 Hone in on the best fishing locations by also factoring in the maximum depth at which your vessel or gear can operate. Slide your cursor around and inspect other areas quickly or use GRIB Explorer 9’s FishMap™ tool to transform your single point view to the whole block of the ocean in which you are interested. FishMap™ builds a map of the volume of water in the water column (accessible to your gear) at the temperatures preferred by your target species. It then displays this volume in a color-coded 2D map with blues and greens shading to yellows and reds. The brighter yellows and reds draw your eye to those areas of your fishing block with the best opportunities to find your target species! Once FishMap™ has identified where the ocean locations exist for your best chances for finding the target species, drag your cursor over the top of them to view the depths at which those temperatures are located. If you have downloaded ocean currents or sea surface height or salinity maps with WeatherNet, your GRIB Explorer cursor tracking gives you a heads-up display of the levels of those factors at that same location. It’s easy to do this because the cursor position on the FishMap™ map is mirrored on the main background map. The unique pricing model WeatherNet offers makes the sub-surface temperature, Thermocline and FishMap™ data accessible to you without steep monthly subscription charges. Just pay a single piece fee to download the Thermocline product for your target region. If you need a Thermocline grib only once a week, then pay for it only once a week…or two weeks, or month or on whatever schedule suiting your fishing needs and budget. Sea surface temperature in GRIB format is available from the RTOFS, HYCOM and GHRSST Global. All models are updated daily. GHRSST data represents a composite of all the satellite passes over a given location on the day before today. The spatial resolution of the RTOFS Global and HYCOM data is 0.083 x 0.083 degrees (1/12th degree) and the GHRSST data is at 0.01 degrees. Both RTOFs and HYCOM provide multi-day fiorecasts of sea temperatures as well. Sea surface height data in GRIB format is available from the RTOFS and HYCOM Global models. All models are updated daily. The spatial resolution of the RTOFS and HYCOM Global data is 0.083 x0.083 degrees (1/12th degree). The spatial resolution of the RTOFS HiRes Atlantic data is 0.05 x 0.05 degrees (1/20th degree). The HYCOM and RTOFS data also provides forecasts of sea surface height data out 4 to 5 days. Sea surface salinity data in GRIB format is available from the RTOFS and HYCOM Global model. All models are updated daily. The spatial resolution of the RTOFS and HYCOM Global data is 0.083 x0.083 degrees (1/12th degree). The spatial resolution of the RTOFS HiRes Atlantic data is 0.05 x 0.05 degrees (1/20th degree). 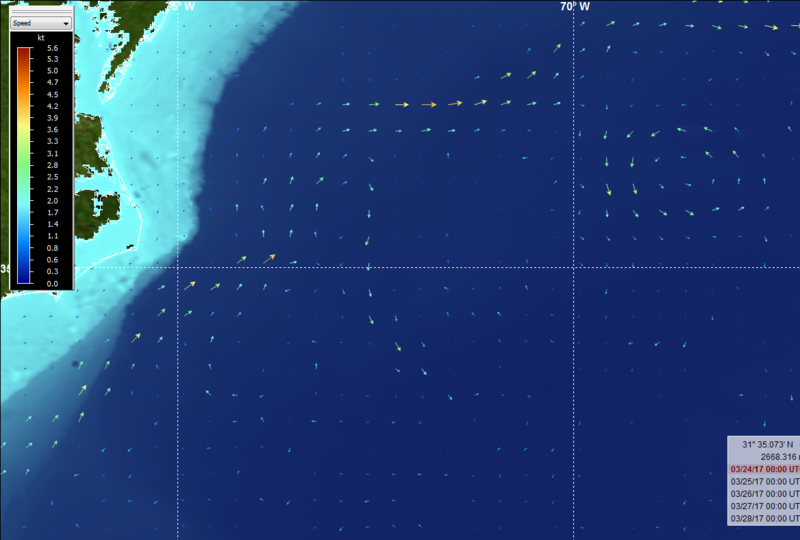 The HYCOM and RTOFS data also provide forecasts of sea surface salinity data out several days. 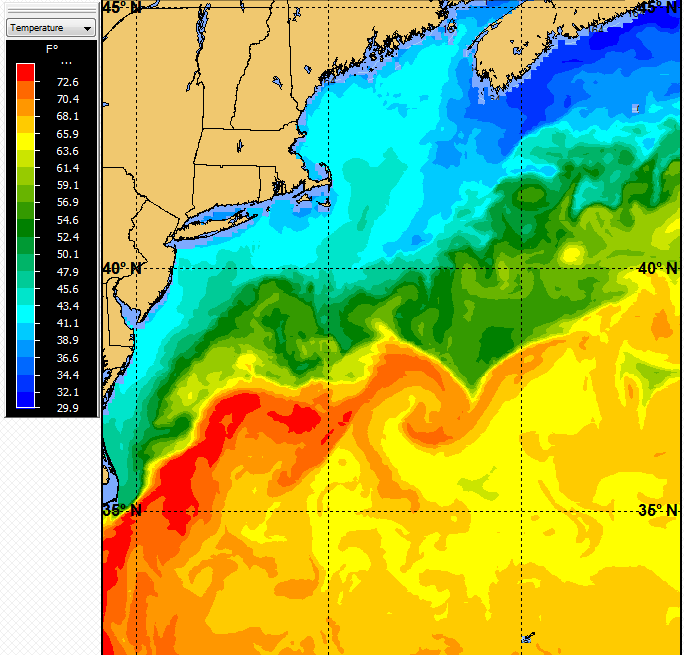 Sea surface currents data in GRIB format is available from the RTOFS and HYCOM Global model. All models are updated daily. The spatial resolution of the RTOFS and HYCOM Global data is 0.083 x0.083 degrees (1/12th degree). The HYCOM and RTOFS data also provide forecasts of sea surface currents data out 4 to 5 days. 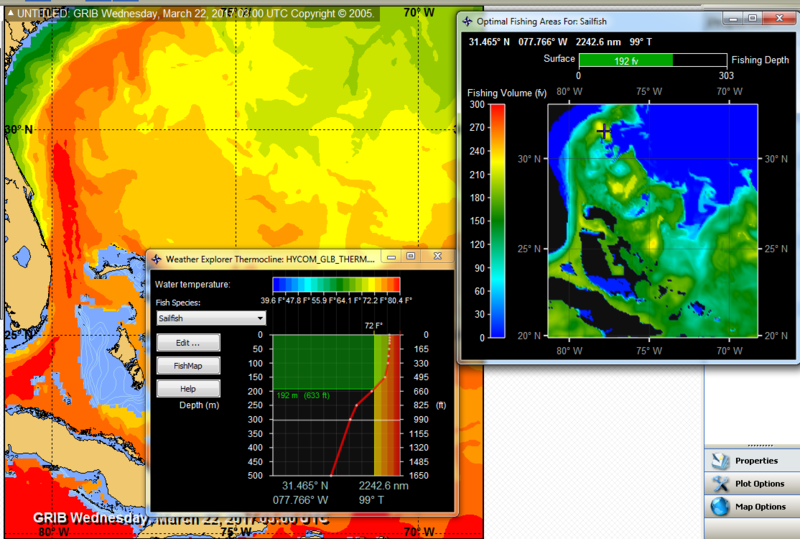 Mixed layer depth data in WeatherNet is available globally in the Thermocline product set. Note: GRIB Explorer software is required.